Columbiana’s Hunter Zentner drives against Wellsville’s Derrick Suggs during Tuesday’s game at Columbiana. COLUMBIANA –On the heels of a heartbreaking overtime loss to Lisbon on Friday, the Columbiana boys basketball team returned to the gym this week vowing to wash the bad taste from their mouth as soon as possible. 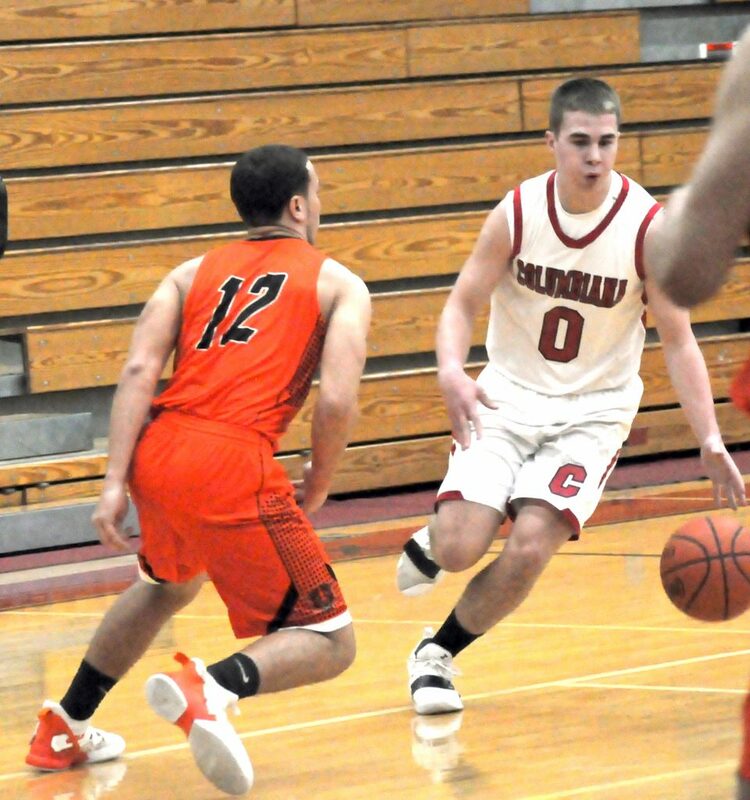 The Clippers did just that Tuesday, leading almost wire-to-wire and holding off a second half rally to upset second-place Wellsville 61-57 in Eastern Ohio Athletic Conference action at Columbiana High School. The Clippers improve to 9-7 overall and 5-6 in the EOAC, Wellsville falls to 8-5, 6-4. 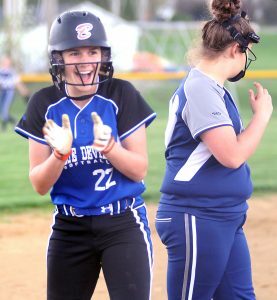 Wellsville’s loss, combined with United’s loss to Southern hands Toronto at least a share of the conference title. The Red Knights own a commanding four-game lead with four games to play. Wellsville, United and Southern are in a three-way tie for second. The Clippers sprinted out to a 15-6 lead after the first quarter and still led by nine with 2:36 left in the third quarter. The Tigers made themselves heard by the end of the night, however. A 10-2 Wellsville run shrunk the lead to 43-42 by the end of the third quarter. The Tigers stayed close all the way to the buzzer. Columbiana’s lead never got larger than four over the last two minutes of the game, but the Clippers held sturdy under the pressure and never relinquished the lead. Fahs kept the Clippers two possessions in front by going 4-for-4 from the line in the final minutes. Guard Hunter Zentner nailed the two clinching free throws with 3 seconds left. The Clippers were powered by the trio of Fahs, Zentner and forward Matt Mazei. Fahs and Zentner each scored 17 points, while Zentner added 12 rebounds and five assists. Mazei was a solid presence all night down low and finished with 14 points and nine rebounds. With Columbiana up 59-56, the Tigers had a shot to tie the game when Garrett Scott was fouled on a three-point attempt with 3.7 seconds left, but he missed two of the three attempts, setting the stage for Zentner to close it out at the other end. Justin Wright led the Tigers with 22 points, while Derrick Suggs added 12 points. Luke Green and Darien Suggs each had eight points and six rebounds. The Tigers were plagued by six straight empty possessions in the fourth quarter with the Clippers clinging to a 54-50 lead. Wellsville will try and break out of the second-place logjam Friday at United, while the Clippers get a crack at first-place Toronto. ¯The Clippers lost 64-56 to Wellsville in the first meeting on December 14. Four of Columbiana’s six conference losses this season have come by single digits. ¯Tyler Anderson hit the go-ahead three with 30 seconds left as Columbiana won the two-quarter jv game 10-9. COLUMBIANA SCORING: Hunter Zentner 6-5-17, Carter Pasco 0-2-2, Seth Ross 0-0-0, Ryan Fahs 6-4-17, Sean Whitehead 3-0-7, Erik Hopfenziz 1-0-2, Quenton Cross 1-0-2, Matt Mazei 7-0-14. TEAM TOTALS: 24-46, 11-15: 61. WELLSVILLE SCORING: Luke Green 3-0-8, Darien Suggs 4-0-8, Garrett Scott 2-3-7, Derrick Suggs 4-3-12, Justin Wright 10-2-22, Justin Talbert 0-0-0. TEAM TOTALS: 23, 8-17: 57.